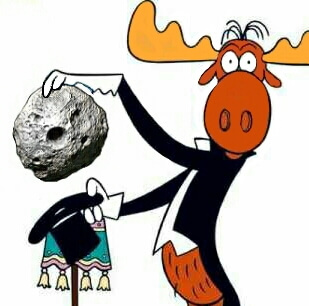 "Hey Rocky - Watch Me Pull an Asteroid Out of My Hat!" In Feb of 2012, Earth collided with a 65ft. 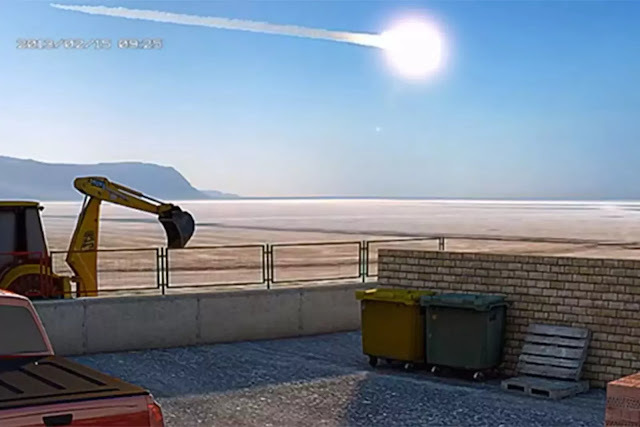 in diameter asteroid, which exploded over the Russian town of Chelyabinsk. We all know the fortunate outcome there--they were extremely lucky, in that, the sonic boom, created by the disintegrating rock (at a height of 15 miles as it careened through our atmosphere toward the ground at 45,000 miles per hour), caused thousands of injuries, partially demolished buildings and shattered windows. Had the asteroid entered the atmosphere at a steeper angle, the results would have been catastrophic. with a force nearly 30 times more powerful than the Hiroshima atomic bomb in 2013.
Credit: Neuromainker via YouTube/Screenshot by Irene Klotz for Discovery News. And we never saw it coming. This meteor snuck right up on us from the direction of the sun, out of sight in the blinding light of day, as if some celestial magician had pulled it out of a hat--then threw it at us. This past April, Earth's orbit intersected the orbit of an asteroid debris field--the debris train, left in the wake of an orbiting, cometary, or, asteroidal body. This particular field is several times the Earth's diameter, and we were right in the thick of it for the entire month of April, as well as the end of March and beginning of June. Earth's atmosphere encounters this field, and others somewhat like it, on occasion, every April, which, due to the pull of gravity produces 'fireballs' (unusually bright) and 'bolides' (exploding) meteors. But, parts of the field have been increasing in density over time. Astonishingly, we've had 16 near-misses by asteroids, since January of this year, some within just a quarter of the distance to the moon, and one, actually, at an altitude of less than our GPS satellites! Most of these objects were just a few meters across, with the exception of one, which was a few kilometers in diameter! So, is this kind of thing common? Could we experience another collision, similar to the Chelyabinsk event? 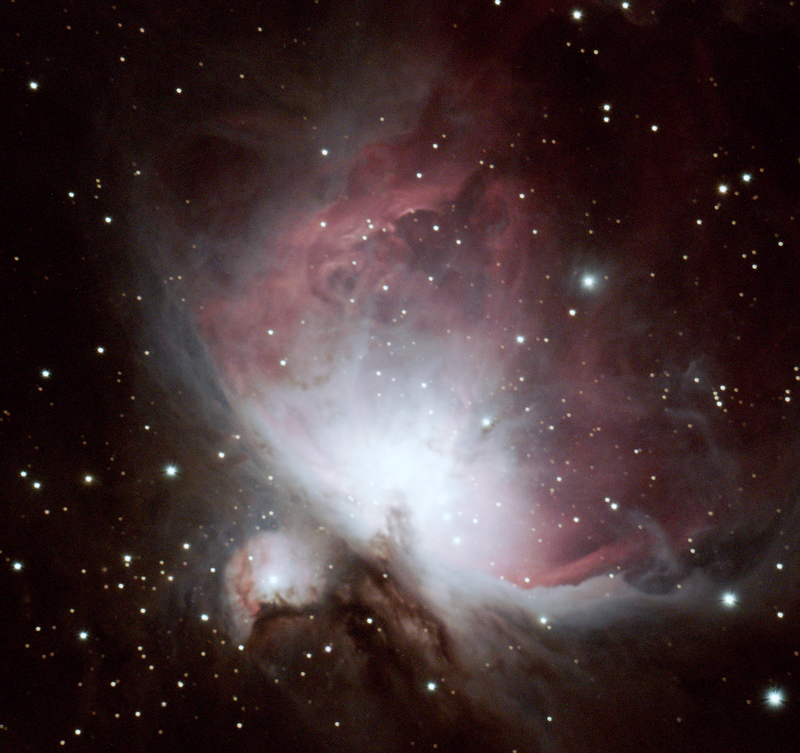 Space--particularly interplanetary space--is not, entirely, empty. At any given time, there is an assortment of asteroidal and cometary debris surrounding the Earth, and in its orbital path around the Sun. Most of this debris is particulate. But, the process of the formation of our solar system, left behind a wide range of sizes of fragmented rock and iron. In our immediate neighborhood, there are asteroids composed of this material ranging in size from bits of dust, to rocks---to boulders---to school buses---even to 5-story apartment buildings! The Chelyabinsk meteorite was the size of the latter. And, there are a few asteroids out there--- the size of small moons! On an average day, Earth's atmosphere encounters two basketball-sized asteroids. In any two-week period, we get slammed, by one SUV-sized asteroid. Some burn up, entirely in the atmosphere--and, some, make it to the ground. In the early days after the formation of our solar system, there was much more of this material, which ended up on the surfaces of Earth and the moon and other planets. Here on Earth, the processes of weathering and erosion have erased most of the evidence for those impacts. However, there is plenty left-over for orbital physics to play with. Earth--and, ourselves--are moving through space, on our annual revolution around "Sol", our star--our sun (counterclockwise, viewed from the Sun's North Pole), at a speed of 33,000 mph. At the same time, we're rotating on our axis, eastward, at a speed of 1,000 mph. Here's a very fitting analogy: We're driving down the freeway, blindfolded--with the pedal to the floor; eventually, we're going to crash---unless we can prevent it from happening, altogether, with an early detection/warning and response system. 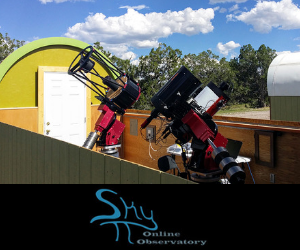 Become a member of the NASA Center for Near-Earth Object Studies (CNEOS), a program which keeps track of these objects by monitoring and plotting their positions, trajectories and velocities. You could--literally--save the world. **The title, some of you may remember, is a take-off on the 60's cartoon styles, "Rocky and His Friends" ("Bulwinkle" was, undoubtedly, his closest!). Great article and very well written by Dale Bryant! Congrats! !